Deciding how to spoil your significant other can be difficult, but it doesn’t have to be. These three simple ideas could just be the trick! Valentine’s Day is coming up in a few days and many couples already have their day planned out. From expensive dinners to cute picnics, the options are endless. But for couples who have been together for a long time, the usual dinner date idea can sound rather boring. READ - Valentine's Day: Too commercialised or worth the fuss? Here are our three picks for simple ways to spoil your other half this Valentine’s Day. It may sound old school but it works. Mixtapes are a great way to rekindle the nostalgia of your first dance together, or even the first time you guys shared a smooch. Throw a few songs on there that really mean a lot to the both of you. If you really want to keep it old school, consider getting a cassette with the songs recorded on it and gift it with a cassette player. It’s the thought that counts, right? Okay, so maybe you won’t be needing the blanket to snuggle up with your partner thanks to the Durban heat, but a romantic movie, popcorn, and other snacks are the perfect option - and not to mention that it’s so simple to set your couch night up. If you’re living in the digital age, stream your favourite romantic movie, or grab a DVD from your local store if you prefer old school. Add the snacks, candles, pillows, and a fan to cool things down and you’re set. Life is busy, and sometimes all you need is to get away from the hustle and bustle of it all. If you have a hardworking partner who can’t seem to put his/her laptop and phone away, consider booking a spa day to treat the special person in your life. All you need to do is call, book, and spoil – it’s that easy. The Camelot Spa at the Pearls Mall, Umhlanga is the perfect spot to do so. They are described as "an ambience of professionalism and luxury, Camelot Spa at The Pearls Mall epitomizes a tranquil oasis in the bustling coastal town of Umhlanga." The Camelot Spa Group is the largest spa group in Africa, and they have 19 Camelot Spas and 13 Spa Wellness by Camelot branches countrywide. They offer a host of treatments which include massage therapy, skin therapy, and a host of beauty treatments. 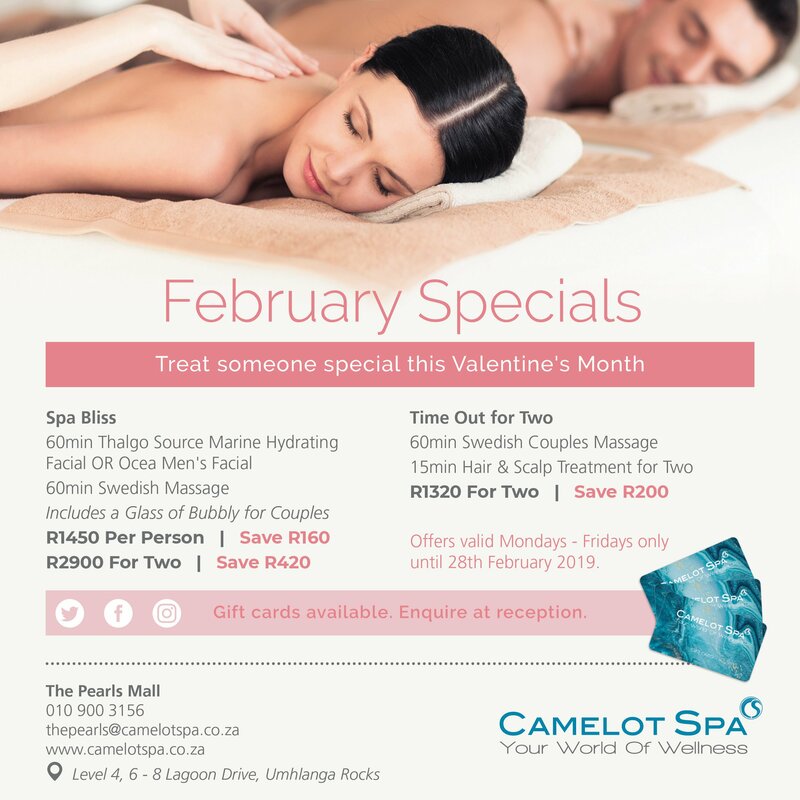 Stand a chance to win a voucher which includes a 60-minute full body massage (Swedish), a wash and blow wave, and a stint in the Camelot Relax Room courtesy of The Camelot Spa valued at R900. All you need to do is tell us how many Camelot Spas are within the spa group in Africa? Drop your answer below, and you could be chosen if you're lucky. Winners will be selected at random. Goodluck. T's and C's apply!